We had recommended Majestic Auto here at just Rs 60/- (then at approximately at 80% discount to its value of investments). The stock has been hitting upper circuits for last few days and is trading @ 138.75 now. The valuation gap discussed earlier has now reduced to approx 52% now from 80% earlier. We would recommend investors to book profits at current levels and upsides. The other stock idea on the similar concept is – BNK Capital. We had discussed the same at our blog here. BNK capital is still available at more than 75% discount to NAV value. We earlier discussed about Hero Honda and Majestic Auto at our blog and the valuations just keep improving. As expected, Hero Honda has appreciated from approx Rs 1,600 to Rs.1935 i.e. 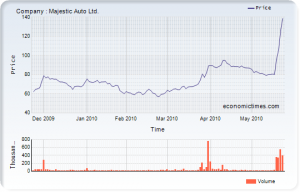 a gain of 21% in less than 5 months; while Majestic Auto is yet to follow. The current upside in Hero Honda is creating fresh opportunity for Majestic as the gap between the Market Value of Investments (16.25 lac shares of Hero Honda) and the companies own market cap is widening everyday. Apart from these investments, the company also has a factory, land and other assets. Hero Honda has once again come out with brilliant performance. I have been missing investing into this company for quite some time. 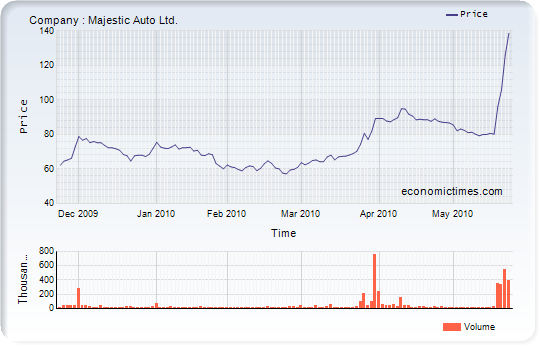 Another beneficiary of the stock price of Hero Honda is Majestic Auto. Majestic holds 16.25 lac shares of Hero Honda valued at 262 Cr, as of today, while it’s own M Cap is just 69 Cr. It also has other hidden assets like factory, land and other business interests. The company will also benefit by way of higher dividend – which Hero Honda should payout this year.